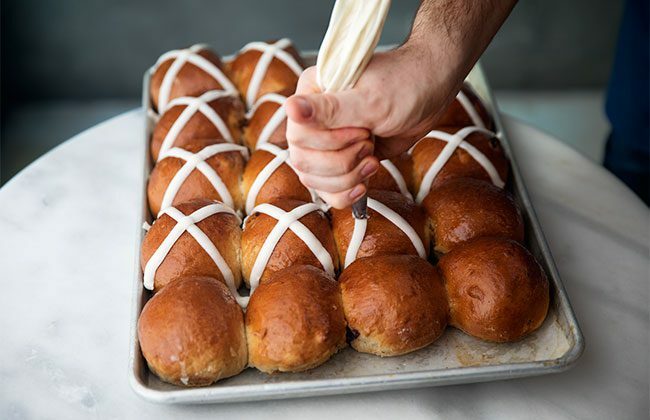 Macdonald, who opened Patisserie Chanson in New York two years ago, used a ‘nutriglaze’ to create the Scotch Cross Buns, which means the whisky is heated but not to the point where the alcohol evaporates, giving the buns a boozy glaze. The buns, which are made using The Dalmore 12 Year Old, will be available from Patisserie Chanson in Manhattan and Mac & Wild restaurants in London over the Easter holiday. The venues will also encourage guests to pair their buns with three whiskies made by Whyte & Mackay: Tamnavulin Double Cask, Jura 10 Years Old and The Dalmore 12 Years Old. “At Whyte & Mackay we wanted take a moment to celebrate and enjoy our whisky,” said Kieran Healey-Ryder, global head of communications at Whyte & Mackay. “We identified the humble hot cross bun as our next innovation opportunity. The Scotch Cross Bun is a truly unique limited edition and a perfect seasonal way for our colleagues in the UK and New York to experience our exceptional whisky. “We were delighted to partner with chef Rory Macdonald on this creation; a renowned master of his craft with a commitment to innovation and flavour that we recognise in our own whisky making.